Following the global financial crisis of 2007–08, there was a worldwide resurgence of interest in Keynesian economics among prominent economists and policy makers. This included discussions and implementation of economic policies in accordance with the recommendations made by John Maynard Keynes in response to the Great Depression of the 1930s—most especially fiscal stimulus and expansionary monetary policy. From the end of the Great Depression until the early 1970s, Keynesian economics provided the main inspiration for economic policy makers in Western industrialized countries. The influence of Keynes's theories waned in the 1970s, due to stagflation and critiques from Friedrich Hayek, Milton Friedman, Robert Lucas, Jr. and other economists, who were less optimistic about the ability of interventionist government policy to positively regulate the economy or otherwise opposed to Keynesian policies. From the early 1980s to 2008, the normative consensus among economists was that attempts at fiscal stimulus would be ineffective even in a recession, and such policies were only occasionally employed by the governments of developed countries. In 2008, a rapid shift of opinion took place among many prominent economists in favour of Keynesian stimulus, and, from October onward, policy makers began announcing major stimulus packages, in hopes of heading off the possibility of a global depression. By early 2009 there was widespread acceptance among the world's economic policy makers about the need for fiscal stimulus. Yet by late 2009 the consensus among economists began to break down. In 2010 with a depression averted but unemployment in many countries still high, policy makers generally decided against further fiscal stimulus, with several citing concerns over public debt as a justification. Unconventional monetary policy continued to be used in attempts to raise economic activity. By 2016, increasing concerns had arisen that monetary policy was reaching the limit of its effectiveness, and several countries began to return to fiscal stimulus. Macroeconomic policy focuses on high level government decisions which affect overall national economies rather than lower level decisions concerning markets for particular goods and services. Keynes was the first economist to popularize macroeconomics and also the notion that governments can and should intervene in the economy to alleviate the suffering caused by unemployment. Before the Keynesian Revolution that followed Keynes's 1936 publication of his General Theory, the prevailing orthodoxy was that the economy would naturally establish full employment. 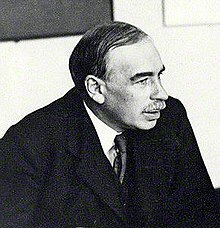 So successful was the revolution that the period spanning the aftermath of World War II to about 1973 has been referred to as the Age of Keynes. Stagnating economic performance in the early 1970s successfully shattered the previous consensus for Keynesian economics and provided support for a counter revolution. Milton Friedman's monetarism school was prominent in displacing Keynes' ideas both in academia and from the practical world of economic policy making. For an overview on the different perspectives concerning optimal balance between public and private power in the economy, see liberal, realist & Marxist. For more detail on specific systems of thought relevant to debate on this fiscal policy see Keynesian economics, Monetarism, the Austrian School, New classical macroeconomics, Real business-cycle theory, and New Keynesian economics. A key common feature of the anti-Keynesian schools of thought is that they argued for policy ineffectiveness or policy irrelevance. Although the theoretical justifications vary, the various schools all hold that government intervention will be much less effective than Keynes had believed, with some advocates even claiming that in the long run interventionist policy will always be counterproductive. Keynesian economics followed on from the Keynesian Revolution. In contrast to the recent resurgence of Keynesian policy making, the revolution initially comprised a shift change in theory. There had been several experiments in policy making that can be seen as precursors for Keynes' ideas, most notably President Franklin D. Roosevelt's famous "New Deal" in the United States. These experiments had been influenced more by morals, geopolitics and political ideology than by new developments in economics, even though Keynes had found some support in the US for his ideas about counter-cyclical public works policy as early as 1931. According to Gordon Fletcher, Keynes' General Theory provided a conceptual justification for New Deal-type policies which was lacking in the established economics of the day. This was immensely significant, as in the absence of a proper theoretical underpinning there was a danger that ad hoc policies of moderate intervention would be overtaken by extremist solutions, as had already happened in much of Europe. However, Keynes did not agree with all aspects of the New Deal; he considered that the almost immediate revival of business activity after the program's launch could only be accounted for by dangerous-to-rely-on psychological factors, such as the boost to confidence effected by Roosevelt's inspiring oratory. Prime Minister Clement Attlee (left) with King George VI. Attlee based the British post-World War II economic policy on Keynes' ideas. While working on his General Theory, Keynes wrote to George Bernard Shaw "I believe myself to be writing a book on economic theory which will largely revolutionize, not I suppose at once but in the course of the next ten years – the way the world thinks about economic problems ... I don't merely hope what I say, in my own mind I'm quite sure". Keynes's ideas quickly became established as the new foundations for mainstream economics, and also as a leading inspiration for industrial nations economic policy makers from about 1941 to the midseventies, especially in the English speaking countries. The 1950s and 1960s period, when Keynes's influence was at its peak, to many appeared in retrospect to have been a golden age. At that time, in contrast to the decades before WWII, the industrialized world and much of the developing world enjoyed high growth, low unemployment and an exceptionally low frequency of economic crises. In late 1965 Time magazine ran a cover article with the title inspired by Milton Friedman's statement, later associated with Richard Nixon, "We are all Keynesians now". The article described the exceptionally favourable economic conditions then prevailing, and reported that "Washington's economic managers scaled these heights by their adherence to Keynes's central theme: the modern capitalist economy does not automatically work at top efficiency, but can be raised to that level by the intervention and influence of the government." The article also states that Keynes was one of the three most important economists ever, and that his General Theory was more influential than the magna opera of his rivals – Adam Smith's The Wealth of Nations and Karl Marx's Das Kapital. 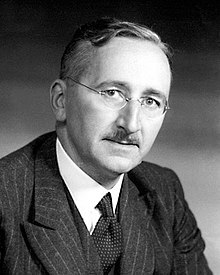 Friedrich Hayek, Keynes' leading contemporary critic. Milton Friedman began to take over this role by the late 1950s. A swelling tide of criticism of Keynesian economics, most notably from Milton Friedman, a leading figure of monetarism, and the Austrian School's Friedrich Hayek, was unleashed by the stagflation of the 1970s. A series of events that contributed to this economic situation included Richard Nixon's imposition of wage and price controls on 15 August 1971 and unilateral cancellation of the Bretton Woods system in 1972, his ceasing the direct convertibility of the United States dollar to gold, as well as the 1973 oil crisis and the recession that followed. In 1976, Robert Lucas of the Chicago school of economics introduced the Lucas critique, which called into question the logic behind Keynesian macroeconomic policy making. The new classical economics became the dominant school in macroeconomics. By the mid-1970s, policy makers were beginning to lose their confidence in the effectiveness of government intervention in the economy. In 1976 British Prime Minister James Callaghan said that the option of “spending our way out of recession” no longer exists. In 1979, the election of Margaret Thatcher as prime minister brought monetarism to British economic policy. In the US, the Federal Reserve under Paul Volcker adopted similar policies of monetary tightening in order to control inflation. In the world of practical policy-making as opposed to economics as an academic discipline, the monetarist experiments in both the US and the UK in the early 1980s were the pinnacle of anti-Keynesian and the rise of perfect competition influence. The strong form of monetarism being tested at this time asserted that fiscal policy is of no effect, and that monetary policy should only try to target the money supply to control inflation, without attempting to target real interest rates. This was in contrast to the Keynesian view that monetary policy should target interest rates, which it held could influence unemployment. Monetarism succeeded in bringing down inflation, but at the cost of unemployment rates in excess of 10%, causing the deepest recession seen in the developed countries since the end of the Great Depression and severe debt crises in the developing world. Contrary to monetarist predictions, the relationship between the money supply and the price level proved unreliable in the short- to medium-term. Another monetarist prediction not borne out in practice was that the velocity of money did not remain constant, in fact it dropped sharply. The US Federal Reserve began increasing the money supply above monetarist-advised thresholds with no effect on inflation, and discarded monetarism in 1984. The Bank of England likewise abandoned its sterling M3 money targeting in October 1985. By 1999, the 1997 Asian financial crisis and the harsh response by the International Monetary Fund (IMF) had already caused free market policies to be at least partially discredited in the eyes of developing world policy makers. The developing world as a whole stopped running current account deficits in 1999, largely as a result of government interventions to devalue the countries' currencies, which would help build foreign reserves to protect against future crises and help them enjoy export led growth rather than just rely on market forces. For the advanced economies, while there was much talk of reforming the international financial system after the Asian crises, it was not until the market failure of the 2000 dot-com bubble that there was a significant shift away from free market policies. In America there was a return by the government of George W. Bush to a moderate form of Keynesian policy, with interest rates lowered to ease unemployment and head off recession, along with a form of fiscal intervention with emergency tax cuts to boost spending. In Britain, Chancellor of the Exchequer Gordon Brown had gone on record saying "the real challenge was to interpret Keynes's insights for the modern world." Yet American and British policy makers continued to ignore many elements of Keynesian thinking such as the recommendation to avoid large trade imbalances and to reduce government deficits in boom years. There was no general global return to Keynesian economics in the first 8 years of the 2000s. European policy became slightly more interventionist after the start of the 21st century, but the shift in a Keynesian direction was smaller than was the case for the US and the UK. However, continental Europeans had not generally embraced free market thinking as wholeheartedly as had the English-speaking world in the 1980s and 1990s. Japan had been using moderate Keynesian policies in the nineties, and switched to neoliberalism with the government of Junichirō Koizumi in 2001–06. For the first half of the 2000s, free-market influences remained strong in powerful normative institutions like the World Bank, the IMF, and in prominent opinion-forming media such as the Financial Times and The Economist. The Washington Consensus view that current account imbalances do not matter continued even in the face of a ballooning US deficit, with mainstream academic opinion only turning to the view that the imbalances are unsustainable by 2007. Another notable anti-Keynesian view that remained dominant in US and UK policy making circles was the idea that markets work best if they are unregulated. In the world of popular opinion, there had been an upsurge in vocal but minority opposition to the raw free market, with anti-globalization protests becoming increasingly notable after 1998. By 2007, there had been bestsellers promoting Keynesian or at least pro-mixed economy policies: Naomi Klein's The Shock Doctrine and Song Hongbing's Currency Wars. In the academic world, the partial shift towards Keynesian policy had gone largely unnoticed. In the wake of the financial crisis of 2007–08 and the search for a way out of the crisis, a worldwide move toward Keynesian deficit financing and general resurgence of Keynesian policies resulted in a new economic consensus, which involved reassessment or even reversal of normative judgments on a number of topics. The Keynesian view receiving most attention has been fiscal stimulus, applied by numerous states as a response to the Great Recession. The IMF managing director Dominique Strauss-Kahn advocated for global fiscal stimulus already in January 2008. Global trade imbalances. Keynes placed great importance on avoiding large trade deficits or surpluses, but following the Keynesian displacement, an influential view in the West was that governments need not be concerned about them. From late 2008 imbalances are once again widely seen as an area for government concern. In October 2010 the US suggested a possible plan to address global imbalances, with targets to limit current account surpluses similar to those proposed by Keynes at Bretton Woods. Capital controls. Keynes strongly favoured the use of controls to restrain international capital movement, especially short term speculative flows, but in the 1970s and 1980s opinion among Western economists and institutions swung firmly against them. During 2009 and 2010 capital controls once again came to be seen as an acceptable part of a government's macroeconomic policy toolkit, though institutions like the IMF still caution against overuse. In contrast to stimulus policies, the return to favour of capital controls still had the momentum as of late 2012. Skepticism concerning the role of mathematics in academic economics and in economic decision making. Despite his degree in mathematics, Keynes remained skeptical about the usefulness of mathematical models for solving economic problems. Mathematics, however, became increasingly central to economics even during Keynes' career, and even more so in the decades following his death. While the Keynesian resurgence has seen no general reversal of opinion on the utility of complex math, there have been numerous calls for a broadening of economics to make further use of disciplines other than mathematics. In the practical spheres of banking and finance, there have been warnings against overreliance on mathematical models, which have been held up as one of the contributing causes of the 2008–09 crises. In March 2008, leading free-market journalist Martin Wolf, chief economics commentator at the Financial Times, announced the death of the dream of global free-market capitalism, and quoted Josef Ackermann, chief executive of Deutsche Bank, as saying "I no longer believe in the market's self-healing power." Shortly afterward economist Robert J. Shiller began advocating robust government intervention to tackle the financial crisis, citing Keynes. Macro economist James K. Galbraith used the 25th Annual Milton Friedman Distinguished Lecture to launch a sweeping attack against the consensus for monetarist economics and argued that Keynesian economics were far more relevant for tackling the emerging crises. Much discussion among policy makers reflected Keynes's advocacy of international coordination of fiscal or monetary stimulus, and of international economic institutions such as the IMF and World Bank, which he had helped to create at Bretton Woods in 1944, and which many argued should be reformed at a "new Bretton Woods". This was evident at the G20 and APEC meetings in Washington, D.C., and Lima, Peru in November 2008, and in coordinated reductions of interest rates by many countries in November and December 2008. IMF and United Nations economists and political leaders such as British Prime Minister Gordon Brown advocated a coordinated international approach to fiscal stimulus. World Bank's President Robert Zoellick advocated that all developed countries pledge 0.7 percent of their stimulus package to a vulnerability fund for assisting developing countries. Donald Markwell and others argued that the absence of an effective international approach in the spirit of Keynes would risk a return of economic causes of international conflict, which Keynes had identified back in the 1930s. Darling's stimulus announcement was swiftly followed by a similar declaration from China, and over the next few weeks and months from European countries, the U.S. and other countries across the world. In a speech on 8 January 2009, President Elect Barack Obama unveiled a plan for extensive domestic spending to combat recession, further reflecting Keynesian thinking. The plan was signed by him on 17 February 2009. There had been extensive debate in US Congress concerning the necessity, adequacy, and likely effects of the package, which was cut from $819 to $787 billion during its passage through the Senate. On 21 January 21, 2010, the Volcker Rule was endorsed by President Obama. It was a proposal by US economist Paul Volcker to restrict banks from making speculative investments that do not benefit their customers. Volcker had argued that such speculative activity played a key role in the recent worldwide financial crisis. Plans for a new $180 billion stimulus plan were announced by Obama in September 2010. A renewed interest in Keynesian ideas was not limited to Western countries and stimulus plans were a common response to the crisis from nations across the globe. Stimulus packages in Asia were on a par with those in Europe and America. In a speech delivered in March 2009 entitled Reform the International Monetary System, Zhou Xiaochuan, the governor of the People's Bank of China, revived Keynes's idea of a centrally managed global reserve currency. Dr Zhou argued that it was unfortunate that Keynes's bancor proposal was not accepted at Bretton Woods in the 1940s. He argued that national currencies were unsuitable for use as global reserve currencies as a result of the Triffin dilemma – the difficulty faced by reserve currency issuers in trying to simultaneously achieve their domestic monetary policy goals and meet other countries' demand for reserve currency. Zhou proposed a gradual move towards adopting IMF special drawing rights (SDRs) as a centrally managed global reserve currency. Zhou's view was echoed in June 2009 by the IMF and in September was described by the Financial Times as the boldest statement of the year to come from China. In a widely read article on dollar hegemony published in Asia Times Online on 11 April 2002, Henry C.K. Liu asserted that "The Keynesian starting point is that full employment is the basis of good economics. It is through full employment at fair wages that all other economic inefficiencies can best be handled, through an accommodating monetary policy." Liu also advocated denominating Chinese exports in Chinese currency (RMB), as a step to free China from the constraints of excessive reliance on the dollar. According to Anatole Kaletsky, Keynesian stimuli were rapidly followed by "revivals of growth in one country after another, roughly in proportion to the size of the various stimulus plans." China was one of the first nations to launch a substantial fiscal stimulus package, estimated at $586 billion spread over two years, and in February 2009 the Financial Times reported that both government officials and private investors were seeing signs of recovery, such as rises in commodity prices, a 13% rise in the Chinese stock market over a period of 10 days, and a big increase in lending – reflecting the government's success in using state-owned banks to inject liquidity into the real economy. Reviewing events from 2010, economics commentator John Authers found that the stimulus and associated expansionary monetary policy had a dramatic effect in reviving the Chinese economy. The Shanghai index had been falling sharply since the September 2008 bankruptcy of Lehman Brothers, but the decline was halted when news of the planned stimulus leaked in late October. The day after the stimulus was officially announced, the Shanghai index immediately rose by 7.3%, followed by sustained growth. Speaking at the 2010 Summer Davos, Premier Wen Jiabao also credited the stimulus for good performance of the Chinese economy over the past two years. As late as April 2009, central bankers and finance ministers remained cautious about the overall global economy, but by in May the Financial Times was reporting that according to a package of leading indicators there were signs that recovery was imminent in Europe too, after a trough in March. The US was one of the last major economies to implement a major stimulus plan, and the slowdown there looked set to continue for at least a few more months. There was also a rise in business and consumer confidence across most of Europe, and especially in the emerging economies such as Brazil, Russia and India. In June, the Organisation for Economic Co-operation and Development (OECD) reported improvements in global economic outlook, with an overall growth forecast for 2010. The OECD gave the credit to stimulus plans, which they warned should not be rolled back too swiftly. The IMF also reported a better than expected global economic outlook in July, though warning that the recovery is likely to be slow. They credited the "unprecedented" global policy response and echoed the OECD in urging leaders to avoid complacency and not to unwind recession fighting fiscal and monetary policies too soon. In a widely syndicated article published in August 2009, Paul Krugman announced that the world had been saved from the threat of a second great depression, thanks to "Big Government". The US economy emerged from recession in the third quarter of 2009, which the Financial Times credited to the stimulus measures. In November, the managing director of the IMF Dominique Strauss-Kahn repeated the warning against terminating the stimulus measures too soon. The Financial Times, however, reported that significant differences had emerged even within Europe, with senior members of the European Central Bank expressing concern about the risk of delaying the exit for too long. On 8 December 2009, President Obama unveiled what the Financial Times described as a "second stimulus plan" for additional job creation using approximately $200 billion of unused funds that had been pre-approved for the Troubled Asset Relief Program. In the same speech he expressed the view that the initial stimulus had already saved or created 1.6 million jobs. 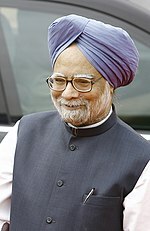 In an article looking back at 2009, economist Arvind Subramanian wrote in the Financial Times that economics had helped to redeem itself by providing advice for the policy responses that successfully prevented a global slide into depression, with the fiscal policy stimulus measures taking their "cue from Keynes". In July 2010 economics journalist Robin Harding wrote for the Financial Times that most American economists are in agreement regarding the large influence of the US stimulus on the economy, though he mentioned high-profile dissenters such as Robert Barro and John B. Taylor. Barro's arguments against the effectiveness of the stimulus have been addressed by Keynesian economics professor J. Bradford DeLong. A July 2010 paper by Moody's Investors Service's chief economist Mark Zandl and former Federal Reserve Vice Chairman Alan Blinder predicted that the US recession would have been far worse without the government intervention. They calculate that in the absence of both a monetary and fiscal response, unemployment would have peaked at about 16.5% instead of about 10%, the peak to trough GDP decline would have been about 12% instead of 4%. Despite the lack of deficit spending, without the intervention the 2010 and 2011 US federal budget deficit was forecast to be almost two times larger, due to the predicted collapse of tax receipts. In August 2010, a report from the non-partisan Congressional Budget Office found the US stimulus to have boosted growth by as much as 4.5%. House of Representatives Minority Leader John Boehner expressed skepticism about the report's accuracy. In March 2011, citing studies on the effectiveness of fiscal stimulus from several dozen economists and international bodies, David Romer told the IMF that "we should view the question of whether fiscal stimulus is effective as settled." In 2009 there were several books published by economists advocating a further shift towards Keynesian thinking. The authors advocated further reform in academic economics, policy making and even the public's general ethics. Theoretical arguments regarding the relative merits of free market versus mixed economy policies do not always yield a clear conclusion. In his 2009 book Keynes: The Return of the Master, economic historian Lord Skidelsky has a chapter comparing the performance of the world economy between the "golden age" period of 1951–73, when Keynesian policies were dominant, with the Washington Consensus period of 1981–2008, when free market policies were adopted by leading governments. Samuel Brittan of the Financial Times called this part of the book the key chapter for the practically inclined reader. Using data from the IMF, Skidelsky finds superior economic performance on a whole range of metrics, except for inflation where he says there was no significant difference. Skidelsky suggests the high global growth during the golden age was especially impressive given that during that period Japan was the only major Asian economy enjoying high growth – the exceptional growth of China and other Asian emerging economies, raising the global average, happened later. He also comments that the golden age, compared with other periods, was substantially more stable. Martin Wolf found that in 1945–71 (27 years) the world saw only 38 financial crises, whereas in 1973–97 (24 years) there were 139. Skidelsky also reports that inequality was generally decreasing during the golden age, whereas since the Washington Consensus was formed it has been increasing. He notes that South America has been an exception to the general rise in inequality – since the late 1990s inequality has been falling there, which James K. Galbraith explains as likely due to the region's early "retreat from neoliberal orthodoxy". In his 2009 book The Keynes Solution, post-Keynesian economist Paul Davidson makes another historical case for the effectiveness of Keynesian policy, referring to the experience of the United States during the Great Depression. He notes how economic growth and employment levels increased for four successive years as the New Deal policies were pursued by President Roosevelt. When government spending was cut back in 1937 due to concerns about the budget deficit, all the gains were lost in one year, and growth only resumed after spending increased again from 1938, as a response to growing acceptance of deficit spending in a recession and later due to World War II. For Davidson, this experience validates the view that Keynesian policy has the power to deliver full employment and prosperity for a government's entire labor force. Davidson also wrote that both price stability and employment in the Keynesian age were superior even to the classical gold standard era that was terminated by World War I. On 8 November 2008, Paul Davidson and Henry C.K. Liu co-authored an open letter to world leaders attending the November 15 White House summit on financial markets and world economy, urging reconsideration of Keynes' analytical system that contributed to the golden age of the first quarter century after World War II. The letter, signed by many supporting economists, advocates a new international financial architecture based on an updated 21st century version of the Keynes Plan originally proposed at Bretton Woods in 1944. The letter ends by describing this new international financial architecture as aiming to create (1) a new global monetary regime that operates without currency hegemony, (2) global trade relationships that support rather than retard domestic development and (3) a global economic environment that promotes incentives for each nation to promote full employment and raise wages for its labor force. A marked shift towards Keynesian thinking took place among prominent economists. Some, such as Paul Krugman, James Galbraith and Brad Delong, were already Keynesians, but in 2008 began to get considerably more attention for their advocacy of Keynesian policy. Others, such as Richard Posner and Martin Feldstein, had previously been associated with anti-Keynesian thinking, yet by 2009 publicly converted to Keynesian economics, which made considerable impact on other economists. Posner's 2009 book, A Failure of Capitalism, was a critique of laissez-faire capitalism and its ideologues. This shift towards Keynesian thinking was widely shared by many politically active economists across the world. In the years leading up to the resurgence, Germany had been home to some of the most outspoken critics of Keynesianism, yet according to economist Sebastian Dullien writing in December 2008, "important voices in the German economic profession are now calling for a large stimulus package, passed as quickly as possible".The New York Times reported that in the March 2008 annual meeting of the American Economic Association, economists had remained hostile or at least sceptical about the government’s role in enhancing the market sector or mitigating recession with fiscal stimulus. But already during the January 2009 meeting virtually everyone voiced their support for such measures. There were a few high-profile known dissenter economists, such as Robert Barro and Eugene Fama, but in 2008 and early 2009 their objections had little influence on the mainstream debate. A dissenter from Germany had been Stefan Homburg, who in January 2009 complained "I simply cannot understand how so many economics professors have done a complete U-turn. Have they all gone mad?" Among the less publicly prominent economists, who tend to debate only with their fellows and write mainly in technical journals, a substantial shift in opinion was less obvious. Speaking in March 2009, Galbraith stated that he had not detected any changes among academic economists, nor a re-examination of orthodox opinion in the journals. Until 2008, the consensus among most mainstream economists was that fiscal stimulus did not work. New Keynesians and New Classical economists had previously agreed monetary policy was sufficient for most downturns and the two schools of thought debated only technicalities. The extent of the recession made the New Keynesians re-evaluate the potential of large stimulus, and their debates with New Classical economists, who often opposed stimulus entirely, became substantive. Some economists (primarily post-Keynesians) accused the New Keynesian system of being so integrated with pro-free market neo-classical influences that the label 'Keynesian' in this case could be considered a misnomer. By mid-2010, interest in Keynes' ideas was still growing within academia, even though the apparent consensus among prominent economists had fractured and the revival in Keynesian policy making had to some degree stalled. In October 2011 journalist John Cassidy noted the large number of new books that had recently come out about Keynes, including from leading universities such as Cambridge and MIT, with more books due to come out towards the end of that year. Keynesian ideas also attracted considerable criticism in this time period. While from late 2008 to early 2010 there was broad consensus among international leaders concerning the need for coordinated stimulus, the German administration initially stood out in their reluctance to fully embrace Keynesian policy. In December 2008, Finance Minister Peer Steinbrück of Germany criticised Gordon Brown's advocacy of Keynesian stimulus, saying "The switch from decades of supply-side politics all the way to a crass Keynesianism is breathtaking." However, by the end of January 2009 Germany had announced a second stimulus plan which, relative to GDP, was larger than Britain's.George Osborne, at the time shadow British chancellor, opposed a return to Keynesian policy from as early as October 2008, saying "even a modest dose of Keynesian spending" could act as a "cruise missile aimed at the heart of recovery." Critics argued that Keynesian policy would be counter-productive – for the reasons of being inflationary, creating more income disparity, and causing consumers to rein in their spending even more as they anticipated future tax increases. In 2009, more than 300 professional economists, led by three Nobel laureates in economics, James M. Buchanan, Edward C. Prescott, and Vernon L. Smith, signed a statement against more government spending, arguing that "Lower tax rates and a reduction in the burden of government are the best ways of using fiscal policy to boost growth." Robert Barro, an economics professor at Harvard University (author of the 1974 Ricardian equivalence hypothesis postulating that government stimuli are inefficient in a perfect market), argued that US stimulus spending might be unwise because of one of the factors the US stimulus package depended on for its effectiveness, the "multiplier effect". The fiscal multiplier, required to be over the value of one for the effect to take place, was in practice close to zero – not 1.5 as he said the Obama team were assuming – which means the extra employment generated by the stimulus would be cancelled out by less output and investment in the private sector. A group of German economists had also argued that the size of the multiplier effect was overestimated, while the Memorandum Group of German Economics Professors claimed the opposite and demanded a larger stimulus. Economist Edward Prescott (author of the real business-cycle model that post-Keynesians hold failed to forecast the crisis) and economist Eugene Fama argued that stimulus plans are unlikely to have a net positive effect on employment, and may even harm it. Economist Jeffrey Sachs doubted a positive effect because the stimulus and associated policies "may work in the short term but they threaten to produce still greater crises within a few years". In a June 2010 article, referring to the cooling of enthusiasm for further stimulus found among policy makers at the 2010 G-20 Toronto summit, Sachs declared that Keynesian economics is facing its “last hurrah”. There have also been arguments that the Great Recession of the early 21st century was caused not by excessively free markets but by the remnants of Keynesian policy. Luigi Zingales of the University of Chicago argued that "Keynesianism is just a convenient ideology to hide corruption and political patronage". In February 2009, Alan Reynolds, senior fellow at the Cato Institute, acknowledged the Keynesian resurgence, but stated that evidence from various studies suggest Keynesian remedies will be ineffective and Keynesian advocates appear to be driven by blind faith. In 2009, historian Thomas Woods, an adherent to the Austrian school of economics, published the book Meltdown, which places blame for the crisis on government intervention and points to the Federal Reserve as the primary culprit behind the financial calamity. Professor John Bellamy Foster, a sociologist, questioned whether the resurgence had been truly Keynesian in character. He suggested those few economists he regards as genuinely progressive, such as James Galbraith, were now far from the centre of government. He also asserted that it is Karl Marx, not Keynes, that society should look to for a full solution to economic problems. According to Henry Farrell and John Quiggin, by late 2009 the previous apparent consensus for Keynesian policy among prominent economists began to dissolve into "dissensus". There was no reversal to the previous free market consensus, but the apparent unity of the previous year had gone. In part this was due to objections from anti-Keynesians like Robert Barro attracting wider attention, in part to the intervention of elite economists who had previously kept out of the debate (specifically from the ECB, but also others, including Jeffery Sachs). The lack of consensus among expert opinion made policy makers vulnerable to calls for abandonment of Keynesian policy in favour of fiscal consolidation. In April 2010 a communiqué from the Washington meeting of finance ministers called for continuation of the stimulus policies until the recovery is firmly entrenched with strong private sector activity, though it accepted that some countries had already begun to exit from the policies. By mid-2010, the earlier global consensus for ongoing Keynesian stimulus had fractured, mirroring the "dissensus" that had emerged among prominent economists. Especially in Europe, there was an increase in rhetoric calling for immediate fiscal tightening, following events such as the Greek debt crisis and the displacement of the UK Labour government with a coalition dominated by the Conservatives after the May 2010 elections. While some high level officials, particularly from the US and India, continued advocating sustained stimulus until the global recovery is better established, a communiqué from the G20, issued after their June 2010 meeting of finance ministers in Busan, welcomed the trend towards fiscal consolidation rather than further deficit financed stimulus. The G20 did reiterate that forceful government intervention had been the correct response in 2008 and 2009. Then IMF managing director Dominique Strauss-Kahn, who had been a leading advocate for stimulus spending from as early as January 2008, said he was comfortable with the reversal. European political leaders embarked on substantial austerity drives. In July 2010, leading European economic policy maker Jean-Claude Trichet, president of the ECB, stated that it was time for all industrial nations to stop stimulating and start tightening. Keynesian economists and Keynes biographer Lord Skidelsky contested the move to implement cuts given the still fragile economy. In a July 2010 article, Financial Times columnist Philip Stephens argued that recent events show the markets to have re-established themselves as leading influences on western economic policy, while Brad DeLong wrote that he considered himself and fellow Keynesians to have lost the argument for fiscal stimulus. In April 2011, Professor Patrick Dunleavy wrote that the resurgence has caused a "backlash against the State", starting in America with movements like the Tea Party and later spreading to Europe. He also stated it is likely that ideological wars between rival economic world views have returned for good. In September, Steven Rattner opined that the 2012 US presidential election was shaping up to be a contest between the economic policies of Keynes and Friedrich Hayek - "a clash of ideologies the likes of which America has not seen in decades." Republican candidates openly praised Hayek and Ludwig von Mises. According to Rattner, while the Democrats economic strategy remained largely based on Keynes, the economist's name was now rarely mentioned; "Keynes" had become an almost politically toxic word due to the extensive criticism of the 2009 Keynesian stimulus. Rattner refers to the work of Alan Blinder and Mark Zandi, which determined that the 2009 US stimulus saved about 8.5 million jobs, and with Obama's third stimulus, a $450 billion Jobs plan was projected to create 1.9 million jobs in 2012. Also in September, President of the European Commission José Manuel Barroso called for additional fiscal policy to boost economic growth, while recognizing many European countries did not at that time have the capability to launch a substantial stimulus program. German Chancellor Angela Merkel rejected the idea of further stimulus. By November 2011, efforts to pass Obama's American Jobs Act had been rejected by the US Congress. In Britain, in November David Cameron made a speech in which he recognized a deteriorating economic outlook, but said those arguing for traditional fiscal stimulus were "dangerously wrong". Simon Cox, Asia economics editor for The Economist, predicted that while China might face future economic challenges, the incoming leaders expected to take over the top positions in late 2012 ( Xi Jinping and Li Keqiang ) were far less likely than their predecessor to respond with Keynesian policies. Also in November, The Courageous State book was released by the anti-tax evasion campaigner Richard Murphy, calling for a revival of the Keynesian resurgence, which he argues is the best economic policy for the interests of ordinary people. Murphy sees the resurgence as having faded out by late 2009. Influential figures that had come out against Keynesian policy, even from left of center politics, include the UK Labour Party's Maurice Glasman, whose favorite economist is Hayek, and the diplomat Carne Ross, who asserted that no form of centralized authority can meet the problems of the modern world, arguing for an anti-statist form of participatory democracy instead. In January 2012, Philip Stephens repeated his earlier view that the markets once again have decisive influence on economic policy making, also noting a decline in the public's trust in government in both Europe and the US, along with greater concern over public debt. In March however, while accepting that the resurgence had stalled, Paul Krugman expressed optimism about the long term prospects of achieving a lasting shift towards Keynesianism in both mainstream economics and policy making. In May, Krugman published the book End this Depression Now!, where he repeated his calls for greater use of fiscal stimulus, though according to the Financial Times his proposals were both "modest" and "cautious", reflecting the resistance to such measures since the end of resurgence. In June Krugman and Richard Layard launched A manifesto for economic sense, where they call for greater use of stimulatory fiscal policy to reduce unemployment and boost growth. By mid-2012, with the ongoing Euro crisis and persistent high unemployment in the US, there had been renewed consideration of stimulus policies by European and American policy makers, but no return to the pro-stimulus consensus that existed in 2009. After the 2012 G8 summit, leaders issued a statement recognising the range of opinions concerning the best measures to strengthen their economies. In January 2013, Japan's recently elected conservative government announced a ten trillion yen Keynesian stimulus package, which was to include public works and create an expected 600,000 new jobs. But at the same time the Financial Times published Wolfgang Münchau's article US joins misguided pursuit of austerity, as the great power was abandoning the relatively stimulatory policy it had adopted prior to 2013, repeating, in the author's view, Europe's mistake. In July 2013, Philip Mirowski wrote that not only had the Keynesian resurgence subsided, but the rival economic orientation of neoliberalism had emerged from the financial crisis stronger than ever. In May 2016, three IMF economists published new research findings and criticized some of the fundamental assumptions of the neoliberal doctrine. They warned that austerity policies could do more harm than good because of their social costs – increased inequality, which "in turn hurts the level and sustainability of growth". Speaking of capital account liberalization, that is unrestricted movement of capital across international borders ("openness") and fiscal consolidation, meaning policies to reduce fiscal deficits and debt levels ("austerity"), they wrote: "Since both openness and austerity are associated with increasing income inequality, this distributional effect sets up an adverse feedback loop. The increase in inequality engendered by financial openness and austerity might itself undercut growth, the very thing that the neoliberal agenda is intent on boosting. There is now strong evidence that inequality can significantly lower both the level and the durability of growth". Additionally, they recommended actively combating inequality by redistributing wealth via taxes and government spending, noting "the evidence of the economic damage from inequality suggests that policymakers should be more open to redistribution than they are" and "the fear that such policies will themselves necessarily hurt growth is unfounded". By October 2016 there had been recent increases in fiscal stimulus for many countries, along with calls for this return to fiscal stimulus and demand management policies to increase further, or at least for further research into clarifying the scope for such policies to be effective. Sources for these calls included the IMF, Janet Yellen and senior Whitehouse economist Jason Furman. While some economists and government policy makers remain sceptical, Martin Sandbu for the Financial Times said a return to Keynes original positive views about demand management is underway. Sandbu calls this "paleo-Keynesianism" to differentiate from "new Keynesianism" thinking which had relatively little to say in favour of state intervention in the economy. ^ a b c Chris Giles; Ralph Atkins; Krishna Guha. "The undeniable shift to Keynes". The Financial Times. Retrieved 2009-01-23. ^ Sudeep Reddy (2009-01-08). "The New Old Big Thing in Economics: J.M. Keynes". The Wall Street Journal. Archived from the original on 2009-06-10. Retrieved 2009-03-12. ^ Sumita Kale. "A global Keynesian revival". livemint.com in partnership with The Wall Street Journal. Retrieved 2009-01-23. ^ Quinn Bowman. "Keynes' Economic Theories Re-emerge in Government Intervention Policies". Online NewsHour PBS. Retrieved 2009-09-19. ^ "We are all Keynesians now". Time magazine. 1965-12-31. Retrieved 2008-11-13. ^ Wolassa L. Kumo (February 2009). "The Global Economic Crisis and the Resurgence of Keynesian Economics". California Chronicle. Archived from the original on 2009-11-25. Retrieved 2009-09-18. ^ Lucas, Robert (1976). "Econometric Policy Evaluation: A Critique". In Brunner, K.; Meltzer, A. The Phillips Curve and Labor Markets. Carnegie-Rochester Conference Series on Public Policy. 1. New York: American Elsevier. pp. 19–46. ISBN 0-444-11007-0. ^ Madrick, Jeff (2008-04-08). "The End of the Age of Milton Friedman". Time magazine. Archived from the original on 28 October 2008. Retrieved 2008-11-13. ^ Hunter-Wade, Robert (2005). "11". In John Ravenhill. Global Political Economy. Oxford University Press. p. 293. ISBN 0-19-926584-4. ^ Gordon Brown (2010). Beyond the Crash. Simon & Schuster. pp. 41–46. ISBN 978-0-85720-285-7. ^ Brian D. Blankenship (2012). "Are We All Keynesians Now? Political Ideology and State Deficit Spending in the Great Recession". StudentPulse.com. Retrieved 22 August 2012. ^ Martin Wolf (2010-11-02). "Current account targets are a way back to the future". The Financial Times. Archived from the original on 5 November 2010. Retrieved 2010-11-08. ^ Kevin Gallagher (2010-11-29). "The IMF must heed G20 decisions". London: The Guardian. Retrieved 2011-12-15. ^ Oliver Bush; Katie Farrant; Michelle Wright (2011-12-09). "Reform of the International Monetary and Financial System" (PDF). Bank of England. Archived from the original (PDF) on 2011-12-18. Retrieved 2011-12-15. ^ "The liberalization and management of capital flows: an institutional view" (PDF). International Monetary Fund. 2012-12-03. Retrieved 2012-12-04. ^ Jerome Ravetz (2008). "Faith and Reason in the Mathematics of the Credit Crunch". pantaneto.co.uk. The Oxford Magazine. Archived from the original on 2011-07-18. Retrieved 2010-07-22. ^ "The rescue of Bear Stearns marks liberalization's limit". Financial Times. Retrieved 2008-11-13. ^ "Robert Shiller: The sub prime solution". Google Video. Retrieved 2008-11-13. ^ "The Subprime Solution: How Today's Global Financial Crisis Happened, and What to Do about It". Princeton University Press. Archived from the original on 2008-10-13. Retrieved 2008-11-13. ^ James K. Galbraith. "The Collapse of Monetarism and the Irrelevance of the New Monetary Consensus" (PDF). The University of Texas. Retrieved 2009-02-28. ^ Naughton, Philippe (2009-01-23). "UK recession unlike any other says Gordon Brown". The Times. London. Retrieved 6 July 2010. ^ Zoellick, Robert B. (2009-01-23). "A Stimulus Package for the World". The New York Times. Retrieved 6 July 2010. ^ Donald Markwell (2009). "Keynes and International Economic and Political Relations". Trinity College (University of Melbourne). Retrieved 2009-04-26. ^ Stratton, Allegra (2008-10-20). "Darling invokes Keynes as he eases spending rules to fight recession". London: The Guardian. Archived from the original on 23 October 2008. Retrieved 2008-11-13. ^ Ed Balls (2010-08-27). "Ed Balls' Aug 2010 Bloomberg speech". Labour Party (UK). Archived from the original on 31 August 2010. Retrieved 2010-09-12. ^ Paul Maidment. "China Announces Massive Stimulus Package". Forbes.com. Archived from the original on November 12, 2008. Retrieved 2008-11-11. ^ "Obama signs $787bn stimulus plan". BBC. 2009-02-17. Archived from the original on February 21, 2009. Retrieved 2009-02-23. ^ "House passes Obama economic stimulus plan". msnbc. Retrieved 2008-01-20. ^ David Cho; Binyamin Appelbaum (January 22, 2010). "Obama's 'Volcker Rule' shifts power away from Geithner". The Washington Post. Retrieved 13 February 2010. ^ Anna Fifield (2010-09-08). "Obama unveils new stimulus plans". The Financial Times. Archived from the original on 11 September 2010. Retrieved 2010-09-12. ^ David Pilling (2010-07-21). "Asia's Keynesians take pride in prudence". Financial Times. Archived from the original on July 22, 2010. Retrieved 2010-07-22. ^ "The People's Bank of China—Speeches". Archived from the original on 2009-03-27. Retrieved 2009-03-25. ^ Anderlini, Jamil (2009-03-24). "China calls for new reserve currency". FT.com. Retrieved 2013-06-04. ^ Alexander Nicholson (2009-06-06). "IMF Says New Reserve Currency to Replace Dollar Is Possible". Bloomberg. Retrieved 2009-09-18. ^ Geoff Dyer (2009-08-24). "The dragon stirs". The Financial Times. Retrieved 2009-09-18. ^ Henry C.K. Liu (2002-04-11). "US dollar hegemony has got to go". Asia Times Online. Retrieved 2009-09-18. ^ Henry C K Liu (2009-07-02). "Dollar's future in US hands". Asia Times. Archived from the original on 15 October 2009. Retrieved 2010-01-21. ^ Henry C K Liu (2008-07-29). "Shifting China's Export towards the Domestic Market :Breaking Free from Dollar Hegemony". henryckliu.com. Retrieved 2010-01-21. ^ David barboza (2008-11-09). "China Unveils Sweeping Plan for Economy". New York Times. Archived from the original on May 20, 2013. Retrieved 2009-03-14. ^ Geoff Dyer. "China strains to see light at end of the tunnel". The Financial Times. Retrieved 2009-02-12. ^ Martin Wolf (2010-09-21). "Wen is right to worry about China's growth". The Financial Times. Archived from the original on September 24, 2010. Retrieved 2010-09-23. ^ Chris Giles; Daniel Pimlott; Ralph Atkins (May 11, 2009). "Downturn bottomed out, Trichet signals". The Financial Times. Retrieved 2009-05-19. ^ Chris Giles (May 10, 2009). "Services sector starts to feel more confident". The Financial Times. Archived from the original on February 8, 2011. Retrieved 2009-05-19. ^ Norma Cohen (2009-06-24). "OECD foresees end to global slide". The Financial Times. Archived from the original on June 26, 2009. Retrieved 2009-06-26. ^ Krishna Guha; Sarah O'Connor; Michael Mackenzie (2009-07-08). "IMF says world is pulling out of recession". The Financial Times. Archived from the original on August 14, 2009. Retrieved 2009-07-09. ^ "Recession Loosens Grip But Weak Recovery Ahead". International Monetary Fund. 2009-07-08. Archived from the original on 2009-07-24. Retrieved 2009-07-09. ^ Paul krugman (2009-08-09). "Averting the Worst". New York Times. Retrieved 2009-09-18. ^ "US economy grows by 3.5%". Financial Times. 2009-10-29. Archived from the original on October 31, 2009. Retrieved 2009-10-30. ^ Brian Groom; Ralph Atkins; Tom Braithwaite (2009-11-24). "Divisions emerge on stimulus strategy". Financial Times. Retrieved 2009-11-25. ^ Edward Luce (2009-12-08). "Obama redirects funds to help jobless". The Financial Times. Retrieved 2009-12-11. ^ Barack Obama (2009-12-08). "Speech: Obama on jobs and growth". The Financial Times. Archived from the original on December 14, 2009. Retrieved 2009-12-11. ^ Arvind Subramanian (2009-12-27). "How economics managed to make amends". The Financial Times. Archived from the original on December 14, 2009. Retrieved 2010-01-03. ^ Robin Harding (2009-07-26). "Economists dispute effect of US stimulus". The Financial Times. Archived from the original on 27 July 2010. Retrieved 2010-07-27. ^ Brad Delong (2010-02-26). "Is Fiscal Stimulus Pointless?". Project Syndicate. Retrieved 2010-07-27. ^ Alan Blinder; Mark Zandl (July 2010). "How the Great Recession Was Brought to an End" (PDF). Moody's. p. 4. Archived (PDF) from the original on 28 August 2010. Retrieved 2010-09-01. ^ James Politi; Robin Harding (2010-08-24). "US stimulus boosted growth by up to 4.5%". The Financial Times. Archived from the original on 26 August 2010. Retrieved 2010-08-26. ^ David Romer (2011-03-03). "What Have We Learned about Fiscal Policy from the Crisis?" (PDF). International Monetary Fund. Retrieved 2012-05-18. ^ Samuel Brittan (2009-08-22). "The key to Keynes". The Financial Times. Archived from the original on 15 October 2009. Retrieved 2009-09-18. ^ Paul Davidson. "Reforming the world's international money" (PDF). Real-world Economics Review. Retrieved 2010-03-01. ^ Paul Davidson; Henry Liu (2008-11-08). "open letter: the way forward". Asia Times Online. Retrieved 2009-09-18. ^ Richard Posner (2009-09-23). "How I Became a Keynesian". The New Republic. Retrieved 2012-05-18. ^ "Seven questions for Richard Posner," Interview with Richard Posner, The Economist, 6 June 2009, found at The Economist website. Accessed September 30, 2013. ^ Sebastian Dullien (2008-12-03). "German economists have to take some blame for Merkel's slow reaction". Eurozone Watch. Archived from the original on 2011-09-20. Retrieved 2012-05-18. ^ Louis Uchitelle (2009-01-07). "Economists Warm to Government Spending but Debate Its Form". New York Times. Retrieved 2009-03-11. ^ Alexander Von Neubacher; Michael Sauga (2009-01-26). "Have all gone mad?" (in German). Der Spiegel. Retrieved 2012-05-18. ^ Patricia cohen (2009-03-05). "Ivory Tower Unswayed by Crashing Economy". New York Times. Archived from the original on October 18, 2013. Retrieved 2009-03-14. ^ Rotheim, Roy (1998). "passim, esp forward". New Keynesian Economics/post Keynesian Alternatives. Routledge. pp. viii. ^ Paul krugman (2009-09-02). "How Did Economists Get It So Wrong?". New York Times. Retrieved 2009-09-11. ^ a b Philip Stephens (2010-07-29). "Three years on, the markets are masters again". The Financial Times. Archived from the original on 30 July 2010. Retrieved 2010-07-30. ^ John Cassidy (2011-10-10). "The Demand Doctor". The New Yorker. Retrieved 2011-10-10. ^ George Parker; Bertrand Benoit (2008-10-23). "Berlin hits out at 'crass' UK strategy". The Financial Times. Retrieved 2012-05-18. ^ "Germany starts to look stimulating". Financial times. Retrieved 2009-01-22. ^ George Osborne (2008-10-31). "George Osborne: Recovery through fiscal responsibility" (PDF). Conservative Party (UK). Retrieved 2011-10-10. ^ Tom Clougherty. "How to promote the free market in 2009". The Adam Smith Institute. Retrieved 2010-10-14. ^ Tom Woods. "Tooth Fairy Economics". Campaign for Liberty. Archived from the original on 2009-06-10. Retrieved 2009-03-11. ^ "Petition". Archived from the original on 2009-09-26. Retrieved 2009-09-22. ^ Robert J. Barro (2009-01-22). "Spending Is No Free Lunch". The Wall Street Journal. Archived from the original on 2009-09-26. Retrieved 2009-09-22. ^ Barro, Robert J. (2009) "Demand Side Voodoo Economics," The Economists' Voice: Vol. 6 : Iss. 2, Article 5. Accessed 2009-09-22. Archived 2009-09-26. ^ John F. Cogan; Tobias Cwik; John B. Taylor; Volker Wieland (February 2009). "New Keynesian versus Old Keynesian Government Spending Multipliers" (PDF). Goethe University Frankfurt. Archived from the original (PDF) on 2009-04-07. Retrieved 2009-09-18. ^ Wirtschaftspolitik, Arbeitsgruppe Alternative. Memorandum 2010: Sozial-ökologische Regulierung statt Sparpolitik und Steuergeschenken. 1. Aufl. Papyrossa Verlagsgesellschaft, 2010. ^ Skidelsky, Robert. Keynes: The Return of the Master. 1. Aufl. PublicAffairs, 2009. ^ Will Wilkinson (2009-02-20). "The self-defeating stimulus". The Week. Retrieved 2009-10-05. ^ Jeffery Sachs (March 2009). "The Economic Need for Stable Policies, Not a Stimulus". Scientific American. Retrieved 2009-09-18. ^ Jeffrey Sachs (2010-06-09). "It is time to plan for the world after Keynes". Financial Times. Archived from the original on 29 June 2010. Retrieved 2010-07-22. ^ Chad Crosier. "The Free-Market Hasn't Failed Us, Keynesian Economics Has". Hawaii Reporter. Archived from the original on 2009-07-24. Retrieved 2009-06-24. ^ "Economist Debates – Keynesian principles". The Economist. 2009-02-20. Retrieved 2010-08-25. ^ Alan Reynolds. "Faith-Based Economics". Cato Institute and National Review. Archived from the original on 2009-10-05. Retrieved 2009-10-04. ^ John Bellamy Foster (2009-03-20). "Keynes, Capitalism, And The Crisis". Counter Currents. Retrieved 2009-09-23. ^ Johannes Lindvall (2009). "The Real but Limited Influence of Expert Ideas". World Politics. 61: 703–730. doi:10.1017/S0043887109990104. ^ Chris Giles; Christian Oliver (2010-06-07). "Group scraps stimulus plans". The Financial Times. Retrieved 2010-07-30. ^ Jean-Claude Trichet (2010-07-22). "Stimulate no more – it is now time for all to tighten". The Financial Times. Archived from the original on July 25, 2010. Retrieved 2010-07-30. ^ Robert Skidelsky; Michael Kennedy (2010-07-27). "Future generations will curse us for cutting in a slump". The Financial Times. Archived from the original on 30 July 2010. Retrieved 2010-07-30. ^ Brad DeLong (2010-07-23). "Trichet rejects the counsels of history". The Financial Times. Archived from the original on July 25, 2010. Retrieved 2010-07-30. ^ Brad DeLong (2010-07-06). "Keynes & Co. have lost the stimulus argument". The Week. Retrieved 2012-05-18. ^ Patrick Dunleavy (2011-04-04). "The Backlash against the State". Political Insight magazine. Retrieved 2011-12-30. ^ Steven Rattner (2012-09-12). "The 2012 rivals can be named: Hayek v Keynes". The Financial Times. Retrieved 2012-09-13. ^ Stephanie Kirchgaessner (2012-09-12). "Obama sends jobs plan to Congress". The Financial Times. Retrieved 2012-09-13. ^ Alessandro Torello (2011-09-28). "EU Barroso Calls For Use Of Fiscal Policy To Boost Growth". The Wall Street Journal. Retrieved 2011-10-10. ^ Richard McGregor; James Politi; Anna Fifield; Michael MacKenzie (2012-11-22). "Gridlock fears as US deficit talks fail". The Financial Times. Retrieved 2012-11-22. ^ George Parker; Chris Giles (2012-11-21). "Tackling UK deficit behind schedule". The Financial Times. Retrieved 2012-11-22. ^ Simon Cox (2011-11-17). "Keynes v Hayek in China". The Economist. Retrieved 2012-01-11. ^ Rowenna Davis (2012-01-08). "Ed Miliband cannot be radical and cautious at the same time". New Statesman. Retrieved 2012-01-11. ^ Philip Stephens (2012-01-18). "Leaders who generate diminishing returns". Financial Times. Retrieved 2012-01-19. ^ Paul Krugman (2012-03-23). "The Macro Wars Are Not Over". New York Times. Retrieved 2012-05-18. ^ Robin Harding (2012-05-12). "Austerity bites". The Financial Times. Retrieved 2012-07-11. ^ Paul Krugman; Richard Layard (2012-06-27). "A Manifesto for Economic Sense". Retrieved 2012-07-11. ^ Richard McGregor; Kiran Stacey (2012-05-19). "G8 splits over stimulus versus austerity". The Financial Times. Retrieved 2012-05-21. ^ Michiyo Nakamoto (2013-01-11). "Japan unveils Y10.3tn stimulus package". The Financial Times. Retrieved 2013-01-11. ^ Stephen Harner (2012-12-16). "After a Landslide Election Victory, Japan's Conservatives to Pursue Keynesian Stimulus to Boost the Economy". Forbes. Retrieved 2013-01-11. ^ Wolfgang Münchau (2013-01-06). "US joins misguided pursuit of austerity". The Financial Times. Retrieved 2013-01-11. ^ Philip Mirowski (2014). Never Let a Serious Crisis Go to Waste: How Neoliberalism Survived the Financial Meltdown. Verso. pp. passim, see esp. pp. 1–26, 178, 229, 277–285, 325, 326. ISBN 1781680795. ^ Martin Sandbu (24 October 2016). "The return of Keynesianism" ((registration required)). Financial Times. Retrieved 26 October 2016. ^ Janet Henry (17 June 2016). "Return to fiscal stimulus". HSBC. Retrieved 26 October 2016. Fletcher, Gordon (1989). The Keynesian Revolution and Its Critics: Issues of Theory and Policy for the Monetary Production Economy. Palgrave MacMillan. Robert Skidelsky (2003). John Maynard Keynes: 1883–1946: Economist, Philosopher, Statesman. Macmillan. ISBN 0-330-48867-8. George Akerlof; Robert Shiller (2009). Animal Spirits: How Human Psychology Drives the Economy, and Why It Matters for Global Capitalism. Princeton University Press. ISBN 978-0-691-14233-3. Clarke, Peter (2009). Keynes. Bloomsbury. ISBN 978-1-4088-0385-1. Davidson, Paul (2009). The Keynes Solution: The Path to Global Economic Prosperity. Palgrave Macmillan. ISBN 978-0-230-61920-3. Robert Skidelsky (2009). Keynes: The Return of the Master. Allen Lane. ISBN 1-84614-258-X. Thomas Woods (2009). Meltdown: A Free-Market Look at Why the Stock Market Collapsed, the Economy Tanked, and Government Bailouts Will Make Things Worse. Regnery Publishing. ISBN 1-59698-587-9. John Authers (2010). The Fearful Rise of Markets: Short View of Global Bubbles and Synchronised Meltdowns. Prentice Hall. ISBN 978-0-273-73168-9. Retrieved 2 August 2010. Bateman, Bradley; Toshiaki, Hirai; Marcuzzo, Maria Cristina (2010). The Return to Keynes. Harvard University Press. ISBN 0-674-03538-0. Paul Mason (2010). Meltdown: The End of the Age of Greed (2nd edition). Verso. ISBN 978-1-84467-653-8. Alistair Darling (2011). Back from the Brink: 1,000 Days at Number 11. Atlantic Books. ISBN 978-0-85789-279-9. Rowenna Davis (2011). Tangled Up in Blue. Ruskin. ISBN 978-1-78072-068-5. Richard Murphy (2011). The Courageous State: Rethinking Economics, Society and the Role of Government. Searching Finance. ISBN 978-1-907720-28-4. Carne Ross (2011). The Leaderless Revolution. Simon & Schuster Ltd. ISBN 978-1-84737-534-6. Anatole Kaletsky (2011). Capitalism 4.0. Harper Collins. ISBN 978-0-00-722969-7. Lorenzo Pecchi; Gustavo Piga (2010). Revisiting Keynes. MIT Press. ISBN 0-262-51511-3.